Security from the mother is fundamental to the child's survival and growth. Security is the communication from the mother indicating "I am there for you all the time..." This may be communicated by words, a hug, a look or even a gentle grip, when the child is afraid, confused, troubled or embarking on the unknown. In the painting shown above, I have tried to depict this message from the mother, whose hand is shown gently resting on the daughter’s shoulders. Part of the child’s face hidden in the dark, while rest of the set face is made visible to the viewer. Monochrome palate adds to the dramatic effect. Indian ink takes little time to dry. Hence, it offers the artist time to maneuver the medium on the support, especially if the surface is uneven. For this painting, I had worked with Indian ink using a hard brush on a textured paper. 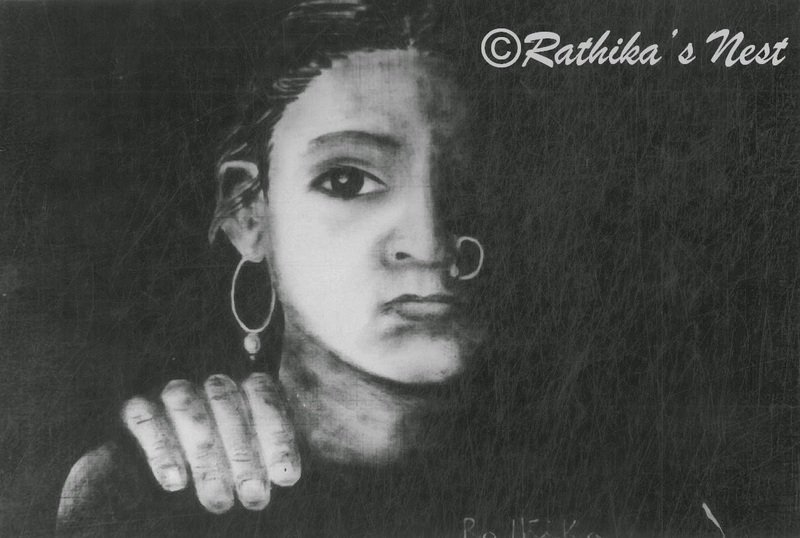 Security (பாதுகாப்பு) is one of my favorite works and was part of the exhibition titled ‘Mother and Child’ at Manasthala Foundations, Chennai, in 2002.